I am interested in the surface ice on Pluto, and I study these ices with other members of the New Horizons science team by observing Pluto at infrared wavelengths. By looking at the different infrared wavelengths of reflected sunlight from Pluto, you can learn about the amounts and distribution of ices like methane, nitrogen and carbon monoxide on Pluto’s surface. We do this from ground-based telescopes, often using NASA’s Infrared Telescope Facility on Mauna Kea in Hawaii. Observing from atop Mauna Kea allows us to get above much of the water vapor in Earth’s atmosphere — which compromises our view from here on Earth. Further, on Earth we are still a long way from Pluto, so we don’t actually resolve Pluto when making these observations — it’s just a dot. When New Horizons gets to Pluto, we will be able to look at the surface of the planet in much more detail and we will be able to learn about the composition of the surface in combination with the topography. 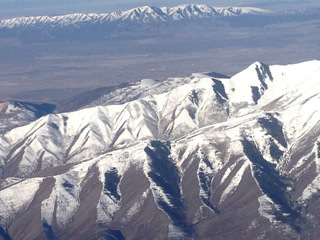 Recently, I was flying from Denver to Salt Lake City and my son took this picture. 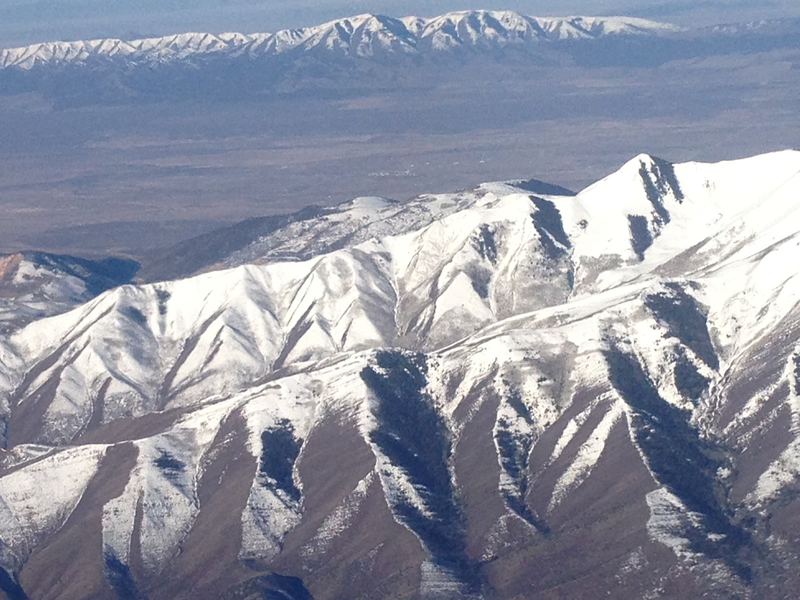 He liked pattern of the dark south-facing slopes and the snow-covered north-facing slopes. I wonder if we will see something similar on Pluto? Cathy Olkin, of the Southwest Research Institute in Boulder, Colo., wears many hats on the New Horizons mission: she is deputy project scientist, Ralph instrument project manager, and director of the Office of the Principal Investigator, handling day-to-day activities such as hiring, financial planning and keeping the project on schedule.